← White out, time out & eat out! An encouraging update from Bryony’s expedition. Bryony and the team report exceptional conditions, managing a distance of over 23km in only 10 hours of skiing. (That’s an average speed of over 2.5km when removing the rest breaks!) The guides feel happy with the team’s progress, which should reach the Antarctic plateau within a week! It was clear talking to Bryony that the team is feeling very lucky with all the good weather and the progress even in the occasional white out! This was no help to Bob, who had a mild cold, which is fortunately now on its way out! The Only way is up! Upping their game to make up extra time (and a few hours extra for rest days) the team completed a trek of 25.2 km. Being struck again with recurring good weather is certainly helping! Although, a slight wind and temperatures can hardly be favourable weather anywhere other than Antarctica! 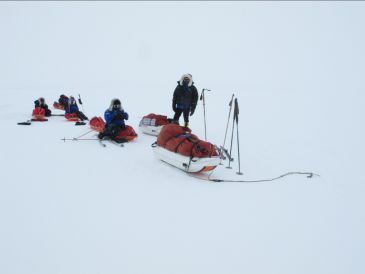 The expedition camped at S 81.33.816, W 81.19.101, more managing just about half a degree of latitude in two days! The terrain is now bringing to take the shape of the imagined polar plateau. With only the very tip of the Patriot Hills to the North on the horizon the team is soon to be within view of their next navigational benchmarks, which is two Nunataks; hopefully in view within the next two days. Nunataks are the tips of mighty Antarctic mountains buried by kilometres of ice! Bob cooking outside on one of the recent calm evenings. The team is relieved to report the terrain is flattening out as they reach the edge of the polar plateau. Only a few days until the team’s first resupply, a regular refuelling station between the Patriot Hills and the Amundsen-Scott South Pole Station.